I had the opportunity to live a new adventure during last week-end. I attended with some Chinese friends the last match of Beijing football team, Beijing Guoan (北京国安) against Shaanxi Baorong (陕西). This team plays in CSL (Chinese Soccer League) and is known as one of the best team in China. I wanted to assist to a football match before end of the season because lot of people told me that it was something to do if you like football. I went close to the Stadium several times during matches and I heard from outside what the fans are capable of. As soon as I arrived close to the Stadium, I feel the excitement of the fans who wear green clothes (jersey, scarf, sweater…) – it was promising! 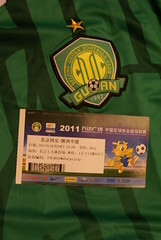 I was also prepared and I had bought online Guoan jersey to look like the supporters. We went into the Worker’s Stadium (工人体育场) 30 minutes before kick-off. The supporters already made a lot of noise with some songs or some klaxon which are similar to vuvuzela (remind the World Cup in South Africa, this incredible noise during the games). 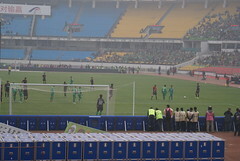 Strange thing – 3/4 of the stadium were fully crowded and the south stand was totally empty. 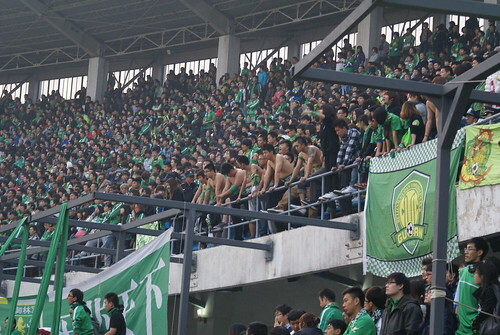 This part should be booked for the opposite team but no supporters made the travel from Xi’an. First incredible moment was the players’ entrance. All supporters took their scarves and raised them in the stadium. 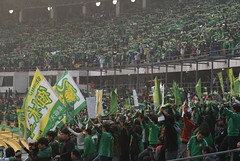 During the game, the supporters never stopped to encourage their team with some fans songs, applauses and some insults to the other team players or the referee (a football game is the right place to learn Chinese bad words). Funny moment during half-time: one supporter who was in our stand proposed to his fiancé. 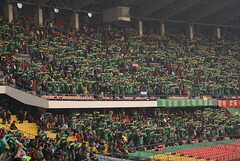 They got a standing ovation from 50 000 Guoan fans. 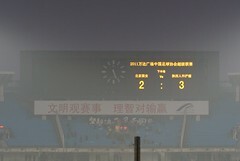 Few comments on the game: Shaanxi won 3 – 2. The technical level in Chinese league is still low and the game was often interrupted by some faults. The Chinese players are used to complain to the referee, fall on the ground after each contact and stay there during long time after a fault. It gave the opportunity to Shaanxi to score the winning goal at 98min or maybe more in the additional time. They are still lot of work to do to catch the European or American level.